The Viking Game, or Tablut, is a very old game. It got it’s origins in northern Europe and was played by the Norwegians, Swedes, Danes, Finns, Icelanders, and the Russians. The ﬁrst known reference of it is in 400 AD. It is believed that the Vikings carried it with them as far as the British Isles, India and Persia, and Baghdad, Iraq. The rules of the game from this era are not known because all that anybody has been able to ﬁnd are various boards, pieces, and cryptic comments in old literature. 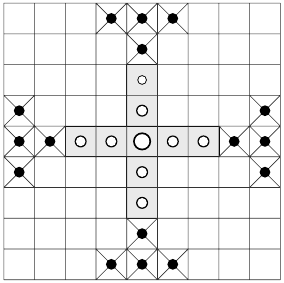 It is known, however, that the game was most commonly referred to as tafl, meaning ”table”. In 1732 Carl von Linnaeus visited Lapland and found the Lapps still playing it. This was the ﬁrst time the rules were known and is the version we know today. It is played on a 9x9 board with one player controlling a King who starts in the centre and who is supported by eight blonde Swedes versus the other player who moves sixteen dark Muscovites. Interception capture — when two pieces of the same color get one opposite piece between them (in the same column or the same row), they capture it. In the following diagram, if White moves as indicated by the arrow, the black piece is captured. All the pieces move like the rook in chess. Only the white king can move into the central square. All pieces can be captured by interception, except the king. Every piece can move to a square with two opposite neighbors in the same row or column without being captured. To capture the king it is necessary to occupy the four adjacent cells (2 in the same row, 2 in the same column), or three cells if the fourth one is the central cell (the throne). For White: the king has to make it from his throne to one of the four borders without being killed by his attackers. For Black: to capture the white king.